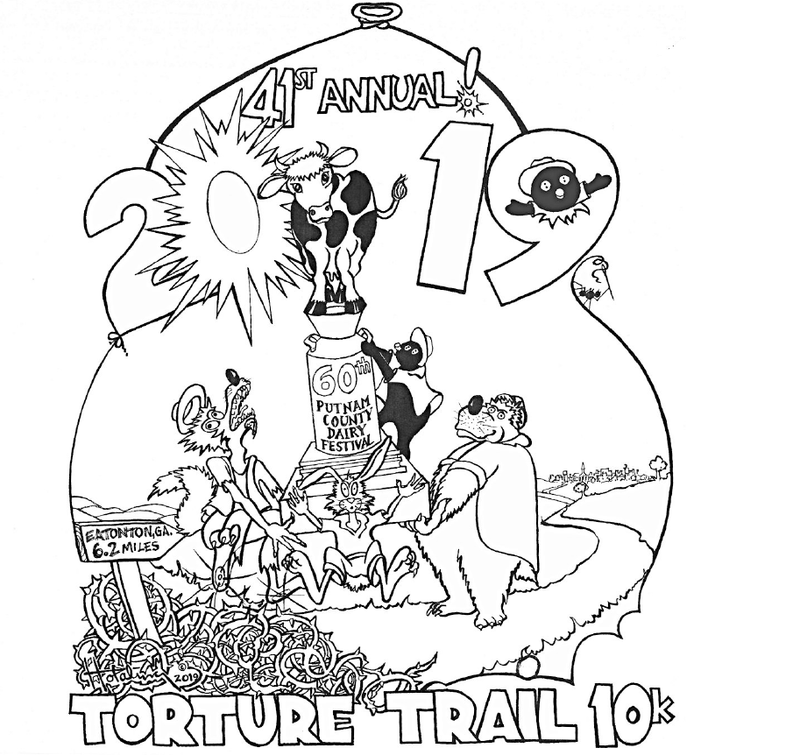 The 41st Annual Torture Trail 10K is one of the longest running 10K races in Georgia! Awards: Stained Glass Awards will be given to the 10K Overall M/F, Masters M/F, and top three M/F in age groups beginning 14 and under through 70 and over. All ages may enter the fun run but awards will be presented only to the first overall M/F and first in each age group: 0-7, 8-9, 10-11, 12-13, 14-15, 16-19, 20-29 and 30 and above. No awards will be mailed. Other Awards: $100 to overall male and female winners given by the Southeast United Dairy Industry Association, Inc unless they fall under the NAIA Amatuer Status Rule. Timing and Results: Chip timing and Finish line management and results provided by Classic Race Services with results posted online to www.classicraceservices.com, www.active.com, www.athlinks.com. Shirts and Goodies: High Quality T-shirts with multi color print featuring Tar Baby, Br'er Rabbit, Br'er Baer and Br'er Fox from the Uncle Remus Stories. No shirts will be mailed. Participants will be treated to ice cream after the race donated by the Putnam County Dairy Association in honor of the Putnam County Dairy Festival. There will be plenty of other refreshments. Course: The course is on paved roads and is USATF Certified #GA11039WC. The course can be challenging, especially in the June heat. Series Affiliation: The race is part of the 2019 Black Bag Race Series and the Run and See Georgia Grand Prix.